That’s Lance Cpl. 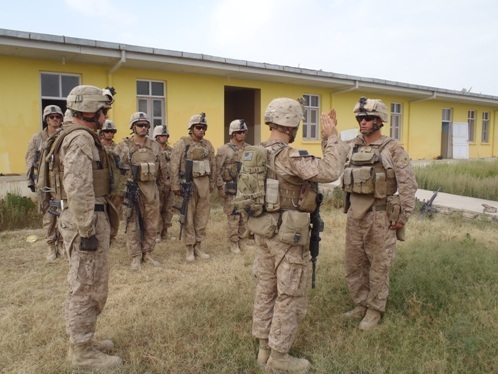 Joseph Starrett re-enlisting recently at the Yellow Schoolhouse, a facility in Marjah, Afghanistan, that served as a staging ground for two squads of Marines last May when I embedded with 3rd Battalion, 6th Marines. I believe I crashed on the floor of the room with the open doorway in the background. Regular Battle Rattle readers will probably remember the schoolhouse well. It was in one of the most violent neighborhoods in Marjah at the time, with Marines taking contact from enemy forces almost daily. Still, they managed to keep good spirits for the most part. Starrett, a Yellow Schoolhouse veteran from 2010, decided to re-up there this year while deployed to Marjah again with 3/6. The unit covered the northern half of Marjah last summer, but is the only infantry battalion based in the district now. First Lt. Jackson Smith, company executive officer with India Company 3/6, shared the photographs. He oversaw Marines at the schoolhouse last year as commander of 3rd Platoon, India Company. Among those present at Starrett’s re-enlistment were Navy Seaman Matthew Dishmon, a corpsman who braved machine gun on July 1, 2010, to pull wounded Lance Cpl. Matthew Earle from a kill zone within a mile of the schoolhouse. “Earle lost nearly five pints of blood after being hit with machine-gun fire, and Dishmon dragged him out of the street while his squad watched tracers pass between Doc’s arms and torso,” Smith said. Dishmon was able to revive him, and both men survived the ordeal. For his actions, Dishmon received the Bronze Star with V device in February. More than 300 students now attend the school, Smith said. 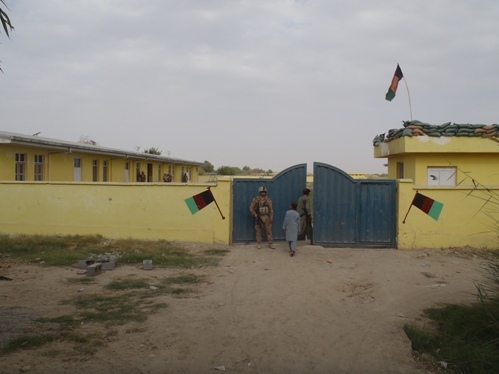 Afghan police run a checkpoint outside its grounds and Marines live within a kilometer, but it is no longer needed as a patrol base. From his lips, my son HMC2 Tyler Burdick (who you met in May, 2010) seriously regrets that instead of being right there, right now, with his beloved 3/6 India Company Marines, he is between Balboa NMC in San Diego and BAMC in San Antonio still trying to save two legs shattered by a July, 2010, IED blast right under his MRAP seat. Thanks for the attention you have focused on him and his comrades. So proud of 3/6! Good luck and be safe. Thanks for the comment. I met your son at COP Yazzie last year. I’m glad to hear Doc Burdick is still pushing forward. Would love to hear more about the 3/6/I co. we are very proud of their hmc2, our son!